Internationally renowned 3D pop artist Charles Fazzino has been selected to create the original artwork commemorating the Hineni Heritage Center’s 40th Anniversary. The piece, entitled “Hineni, 40 Years: The Homecoming of a People” was unveiled on May 9th at the annual Hineni Dinner at the Pierre Hotel in New York City. 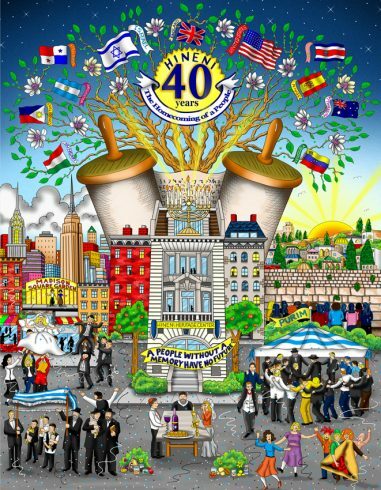 Fazzino’s artwork, which captures the essence of the Hineni mission of reaching out to and reconnecting Jewish people throughout the world, is a vibrant and celebratory tribute to the organization’s 40th anniversary. Encompassing everything from holidays and customs to Jewish heritage, Fazzino’s artwork sends the message of hope, love, and a respect for the Jewish tradition. Proceeds from the sale of the artwork will benefit the Hineni Heritage Center. Pricing and information may be obtained by emailing Hineni@hineni.org or calling 212-496-1660. Charles Fazzino — one of the most popular artists in the world — is most well-known for his unique, detailed, and vibrant three-dimensional style. His work is exhibited in hundreds of fine art galleries and museums in twenty different countries. He is an officially licensed artist of the National Football League and the Super Bowl (2000-present), Major League Baseball and the MLB All-Star Game (2003-present), and the US Olympic Team (2000-present). He has also recently created official artwork for high profile events, including: the 2011 Centennial Celebration for the City of Fort Lauderdale, the President’s Challenge for President’s Council on Physical Fitness and Sports, NASCAR Sprint Cup series, NHL All-Star Game, Belmont Stakes, Daytona 500, Indy 500, Andy Roddick Charity Gala, U.S. Tennis Foundation, CMA Awards, Grammy Awards, Daytime Emmy Awards, NBC’s “Today” Summer Concert Series, Rosie O’Donnell’s For All Kids Foundation and the President William J. Clinton Presidential Foundation, among many others. In 1973, Hineni International was founded by Esther Jungreis. Barbara Janov, has served as Executive Director since its inception. In 1982, the Hineni Heritage Center opened its doors at 232 West End Avenue in New York City. Today, the Center, the first of its kind in the world, offers a comprehensive series of programs, including Torah, Talmud, Kabbalah, Prophets, History, Rituals and Ceremonies in the home and synagogue, Hebrew language and Prayer, and one-on-one tutoring. Hineni also offers lectures, publications, audio and video cassettes, family counseling, an introduction service for singles and social gatherings. There is a constant flow of visitors through its welcoming doors, who leave fortified with a knowledge of their roots, and with the desire to learn more. Rebbetzin Esther Jungries was born in Hungary and is descended from a great rabbinic Dynasty that traces its lineage to King David. A survivor of the Bergen-Belsen concentration camp, founder and president of Hineni, she writes a weekly column for the Jewish Press, lectures extensively all over the globe, and has been featured in numerous national publications such as Newsweek, Time, People, and New York magazine, as well as the New York Times and other major newspapers worldwide. Her children carry on her legacy as authors, lecturers, leaders and teachers at Hineni. Rebbetzin Esther Jungries lives in New York.